Functional training is very simple, it’s exercises designed to help train and develop your muscles to make it easier and safer to do your daily activities, such as carrying groceries or playing sports and running after your children. In this article professional personal trainer Monee gives her thoughts on the benefits of functional training as a workout method in Abu Dhabi. Functional training is very simple, it’s exercises designed to help train and develop your muscles to make it easier and safer to do your daily activities, such as carrying groceries or playing sports and running after your children. Where can I do functional training and how often should I do it? Functional fitness exercises can be done at home or at the gym two to three times a week. 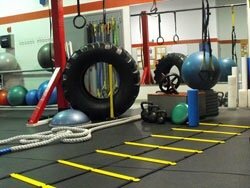 Many Gyms offer functional classes, boot camps or other types of classes using functional tools, such as swiss balls, kettle bells, free weights, sand bags and battle ropes, some even have a special functional station. If you are training at home, you can purchase some tools. For example, sand bags, kettle bells or a swiss ball. Try to do between 45 minutes to an hour workout. What Are The Benefits Of Functional Training And Why Is It Good For Us? Our body is designed to move, not to sit all day. Functional training focuses on training movement patterns rather than isolating individual muscles. It will help to improve your balance, agility and muscle strength and if you suffer from poor posture and muscle imbalance this will help to improve it for you too. It is a great way to burn fat, loose weight and stimulate the whole body to build endurance and boost metabolism. These fat blasting workouts can also increase your stamina and strength. Functional fitness training requires you to move against your own weight. This is exactly the kind of routine that is followed by gymnasts at the Olympics. Such exercises result in great muscle tone and definition. It will also help the relationship between your mind and muscles, meaning if you want to play a certain sport, for example basketball, doing exercises with a heavy ball in functional classes will help you improve your strength, focus and speed whilst playing your favourite sport.